"His imagination was as full of all that he had read-of enchantments, contests, battles, challenges, wounds, courtships, amours, tortures, and impossible absurdities; and so firmly was he persuaded of the truth of the whole tissue of visionary fiction, that, in his mind, no history in the world was more authentic." To begin I will start at the end. 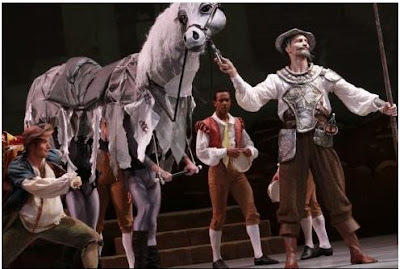 Emma and I (along with a couple thousand others) eagerly leaped from our seats to reward the dancers of the Joffrey Ballet with a well deserved and heartfelt standing ovation following Saturday evening's performance of Yuri Possokhov's, Don Quixote. As the audience cheered, artistic director, Ashley Wheater, presented Victoria Jaiani with a bouquet of white roses for completing her flawless performance and the beaming ballerina passed a rose along to her leading man, Carlos Quenedit, for his memorably powerful portrayal of Basilio. It was a beautifully quintessential night at the ballet. Death defying lifts, welcomed humor, enticing video projections, classically elegant costumes, complex choreography and a large puppet all dovetailed to create what I will long consider to be one of the best nights at the ballet I've ever experienced. Not since we digested the their tragic version of Othello in 2009, have the Joffrey dancers captivated us in the same manner as they did in this world class production. The Joffrey Ballet has long been known as an "all stars" or "no stars" company meaning each dancer is viewed equally and given their chance to shine. 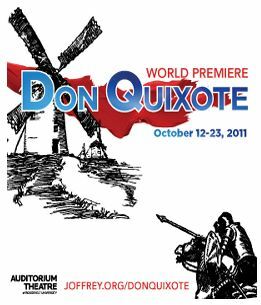 Leading dancers emerge, but not at the expense of celebrating a more athletic dancer in a different piece and Don Quixote celebrated their company of all-stars better than I could have imagined. From character driven funny men to a sultry street dancer and her matador each and every person had their moment to shine last night. Emma was on the edge of her seat as the company handled Possokhov's risky and athletic choreography with a confident ease. The evening was an impressive display of athletic resolve and strong artistic sensibility. What more can you ask for? The Joffrey reached new heights with their powerful production and danced with unity, grace, and power; the city of Chicago is lucky to have them. On the Threshold is up in February. Don't be left out. Buy a ticket. photo credit: Herbert Migdoll/Joffrey Ballet.